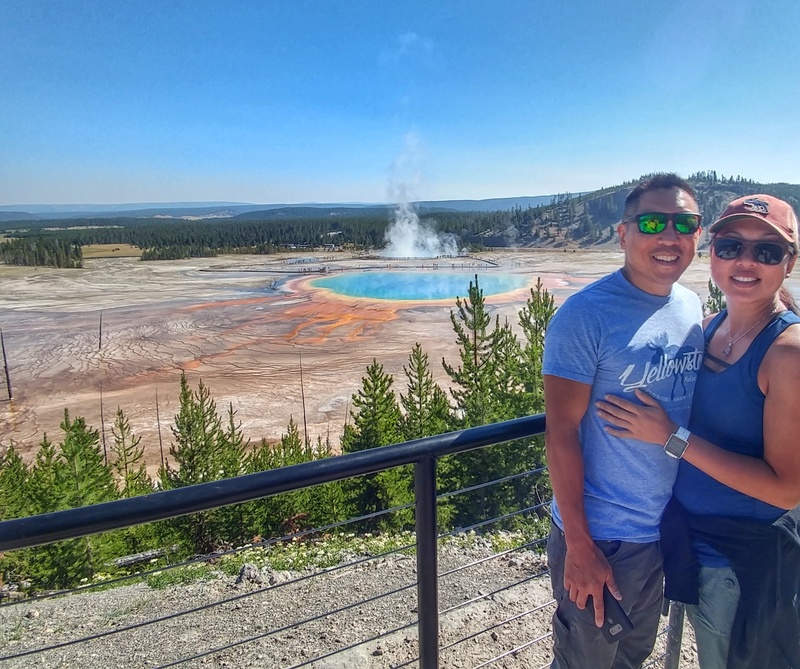 We recently spent eight glorious days fishing, geyser spotting, wildlife watching and hiking at Yellowstone, the world’s (and our country’s) first national park. 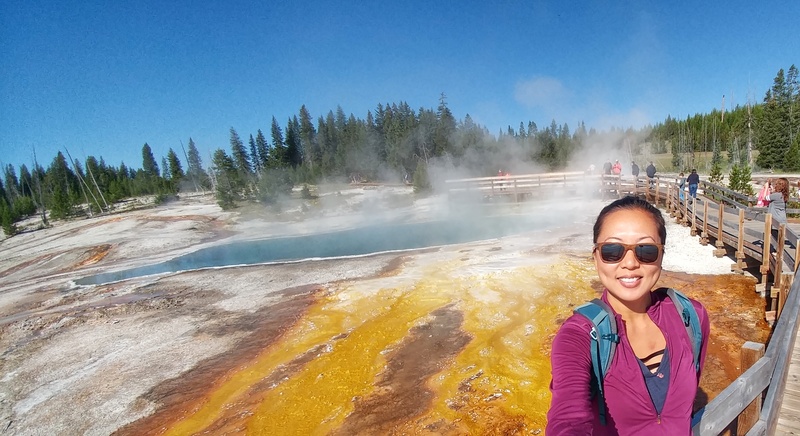 As new visitors to the park, we had high expectations and luckily, our trip to Yellowstone was all we could hope for and more (minus the summer crowds). 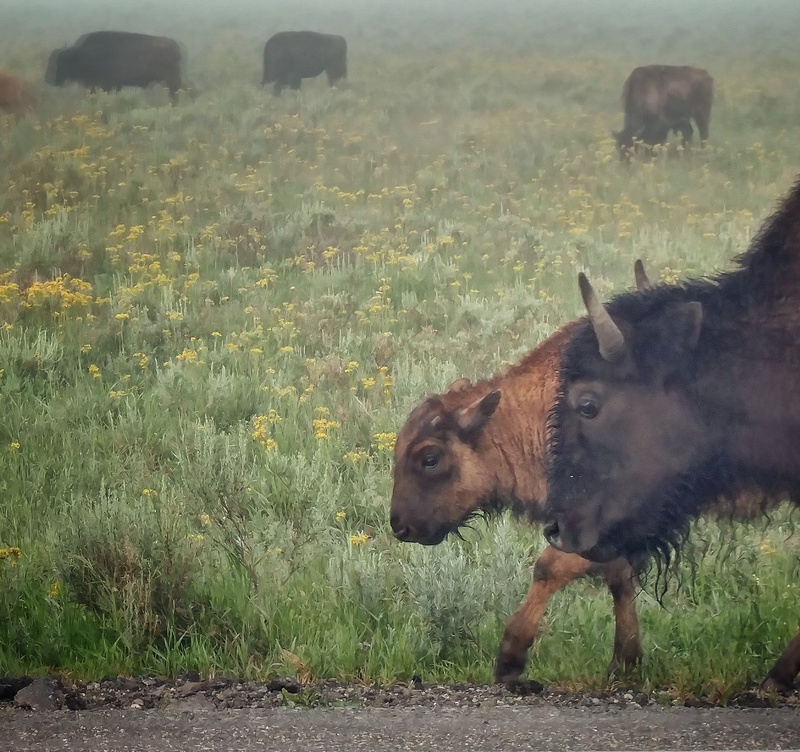 One morning, we headed out early to get a glimpse of wildlife and of the park’s famous bison herds. 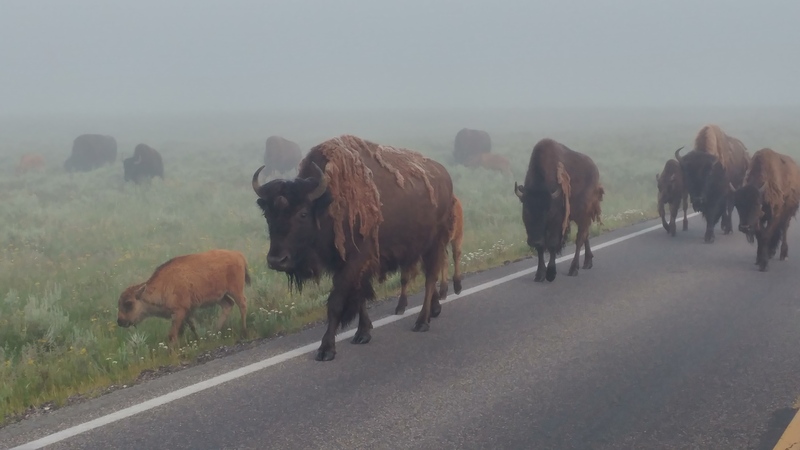 Driving into the valley, we hit a bank of fog and I was worried it would dampen our chances of seeing any animals. Instead, the experience couldn’t have been better! Of course, with all wildlife, you have to exercise caution and not get too close. 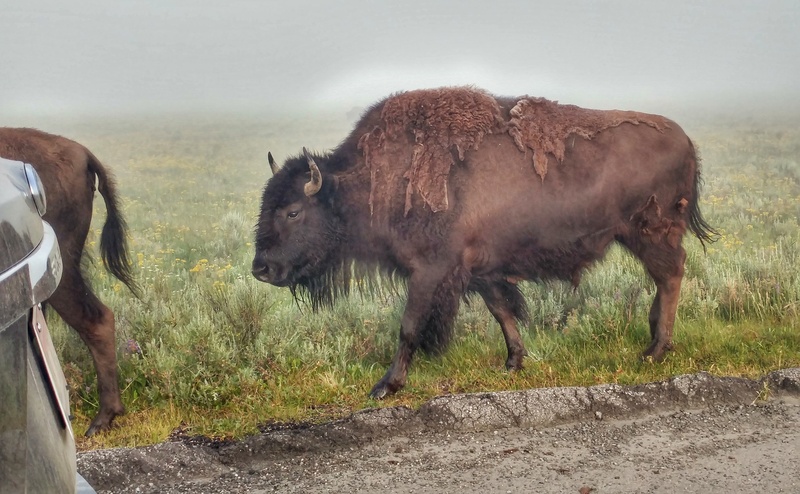 There have been reported cases of visitors being gored and chased by bison. We kept a healthy distance and when the animals came close of their own accord, made sure we had a vehicle to stand behind as a buffer! 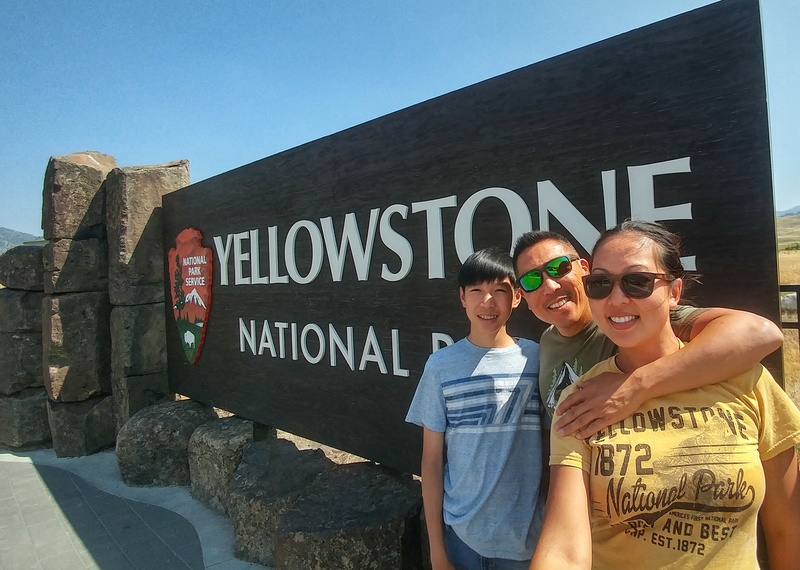 We drove to Bridge Bay for the Yellowstone Lake boat tour we had reserved the week prior. The boat tours leave several times a day and are about an hour long. It’s a pleasant ride across the 140 square mile lake and you’ll also hear some interesting history on the park. 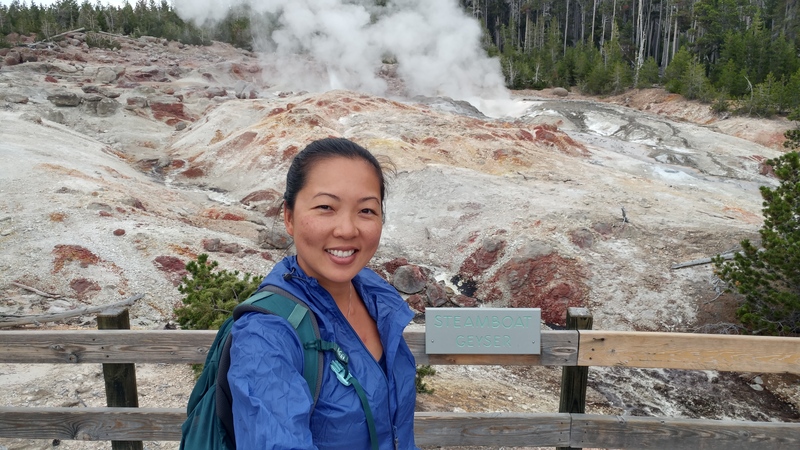 Prior to this trip we didn’t even realize Yellowstone NP had a lake, and a big one at that! 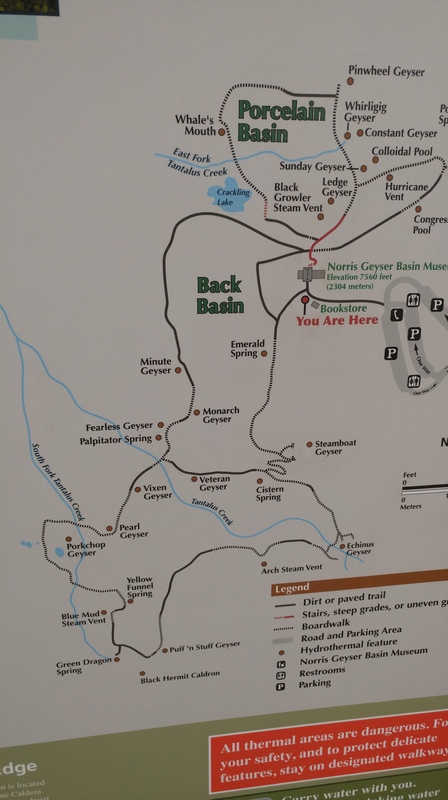 Our next stay was at Canyon Village campground. It has a number of convenient amenities including a gas station, grocery store, auto service, gift shops, and bear spray rental stand! 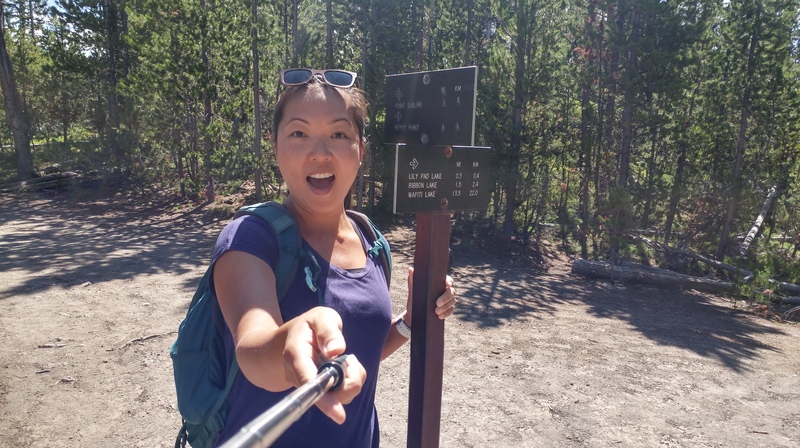 We picked up a 3-day bear spray rental to have some peace of mind while hiking. 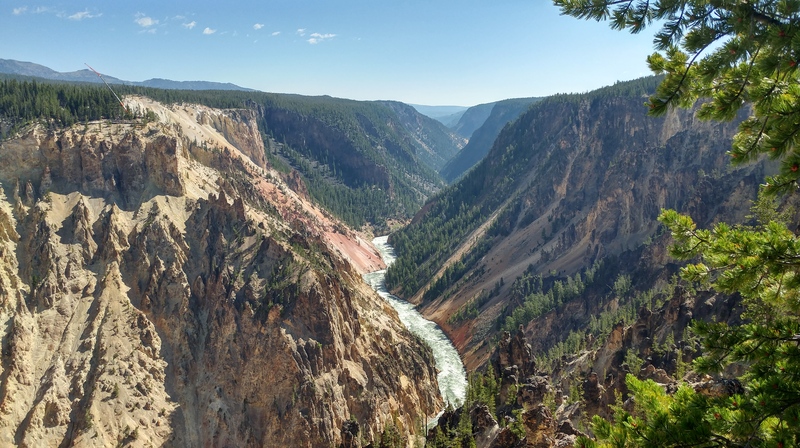 Nearby is an area referred to as the “grand canyon of Yellowstone”, a lofty comparison. 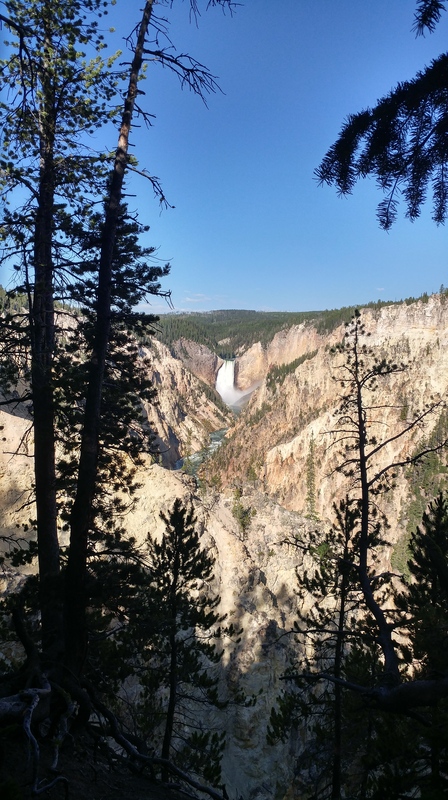 It is, however, a good spot for viewing Yellowstone Falls and enjoying some hiking. The Point Sublime trail starts at Artist Point Overlook, near the parking lot, and is a moderate hike that’s roughly 2.5 miles in length. 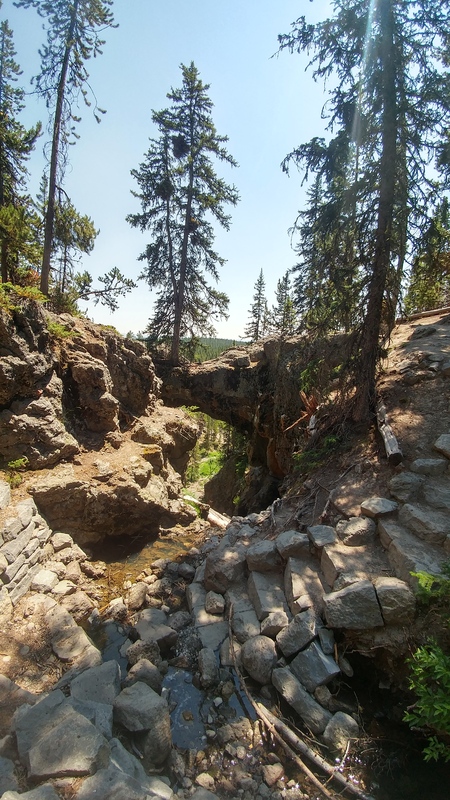 The Madison campground has fewer amenities than Grant Village, Bridge Bay or Canyon Village, but is pleasant nonetheless, and sites are highly sought after. 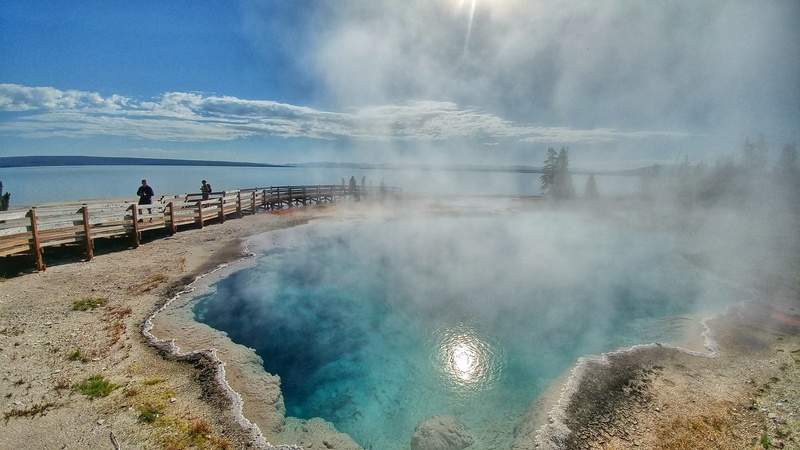 It’s a convenient drive to the Upper, Middle and Lower Geyser basin, including must-see sites like the Grand Prismatic Spring and the ever-popular, Old Faithful. 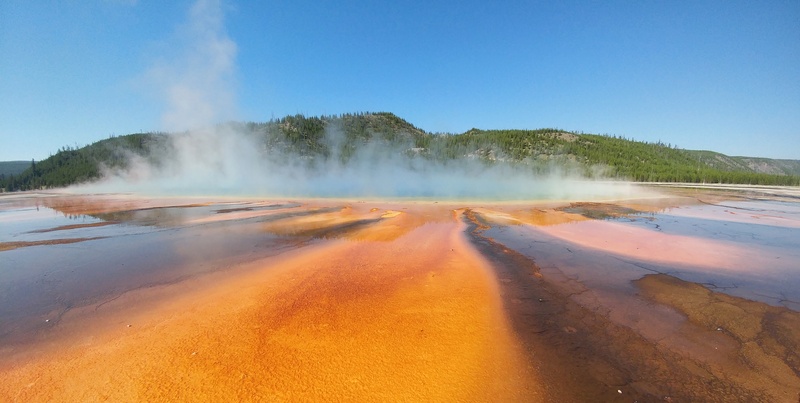 The Grand Prismatic spring was just that – grand and beautiful. While it’s worth walking to it from the boardwalk, the best views were from the overlook further up the road. 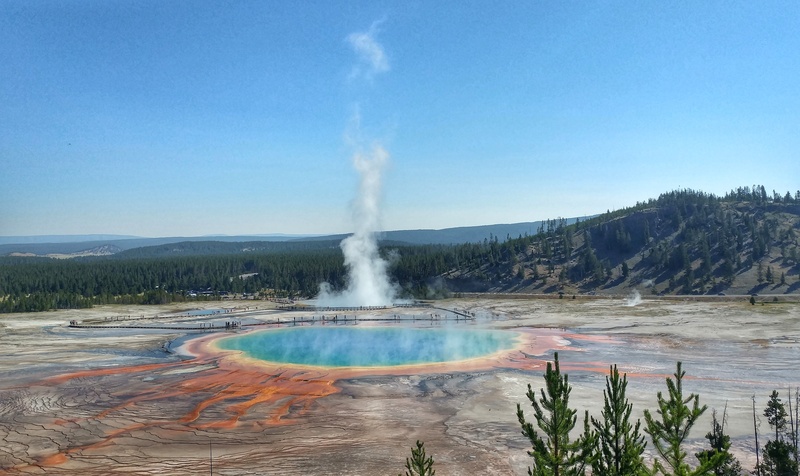 Tip: drive another mile past the Grand Prismatic parking lot and you’ll come to another unmarked parking area which will lead to the trailhead for the overlook. The trail has an uphill climb but is probably less than a mile round trip. Of all the campgrounds we stayed in, Norris was the only one run by the NPS and was first-come, first served with no advanced reservations. We arrived by 7:15am to get in line for a coveted spot and were about 18th in line. (Note: come early as current campers have the option of extending their stay and are given first priority on sites. This means rangers usually have a good approximation of the sites that may be available but it’s not confirmed. Current campers have to renew or check out by 11am, but lines form by 6:30am and all available campsites spots were accounted for by those in line by 8:30am). 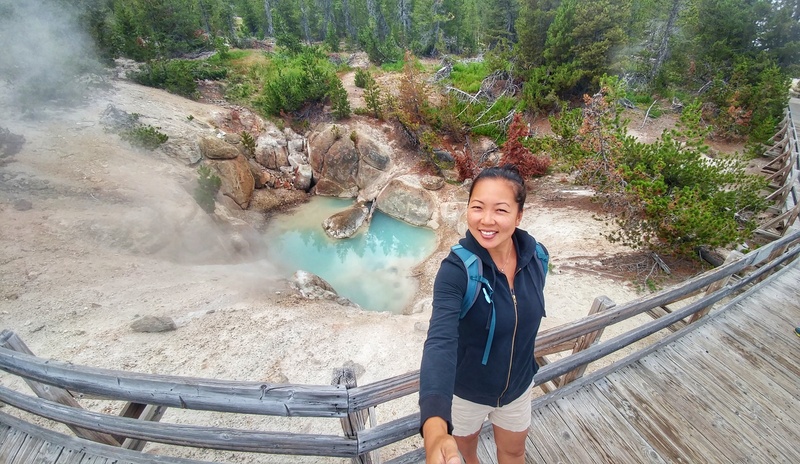 Norris geyser basin is a fun place to visit. There are two boardwalk loops – Porcelain and Back Basin. We walked them both and thought they were great! 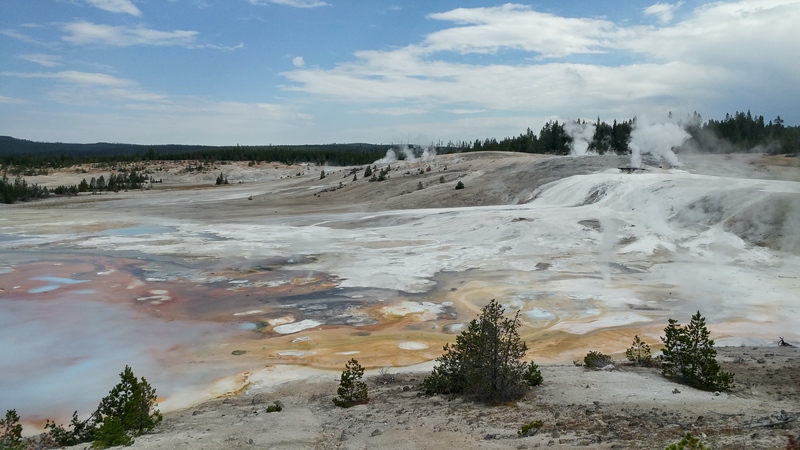 You see a variety of geysers, springs and mud pots. Be prepared for a smelly, sulphorous experience, which is half the fun! 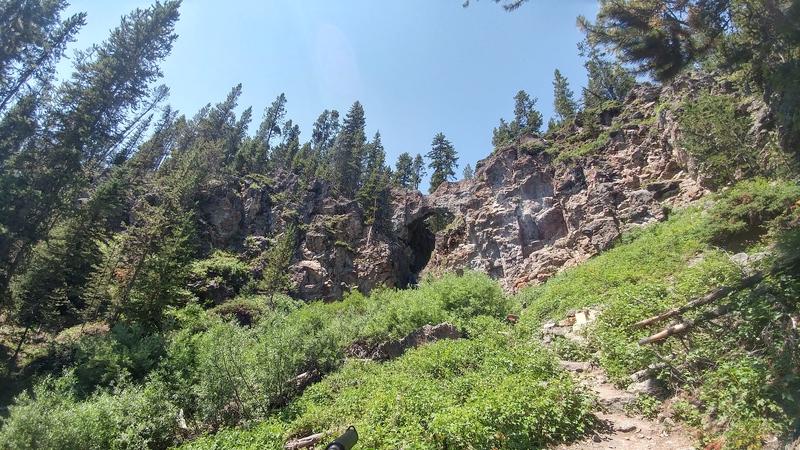 Another good hike is the Mystic Falls trail, accessed from the back of the Biscuit Basin boardwalk. The views of the river and hillsides along the trail are beautiful and you’ll of course get treated to views of Mystic Falls. 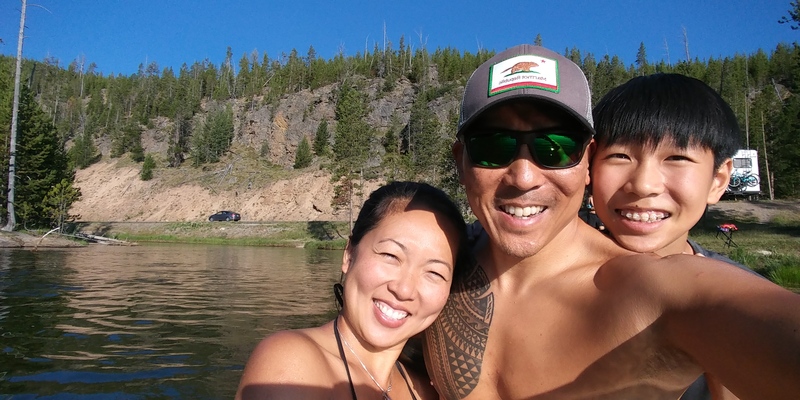 This area is also close to Gibbon River, which came recommended for anglers and was good for some impromptu, chilly swims. 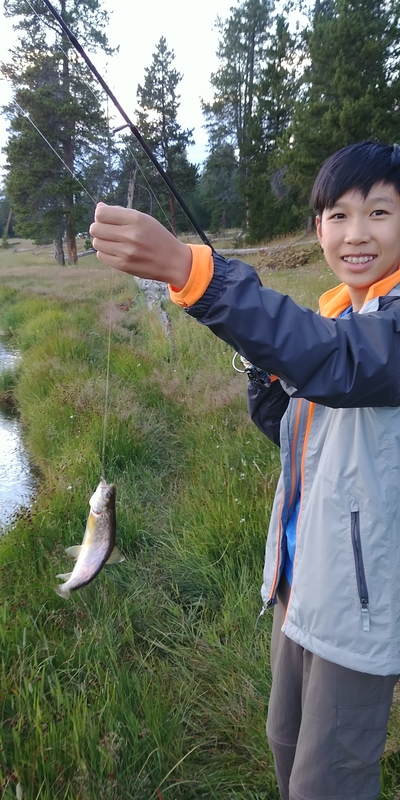 We caught – and released – this native cutthroat trout! 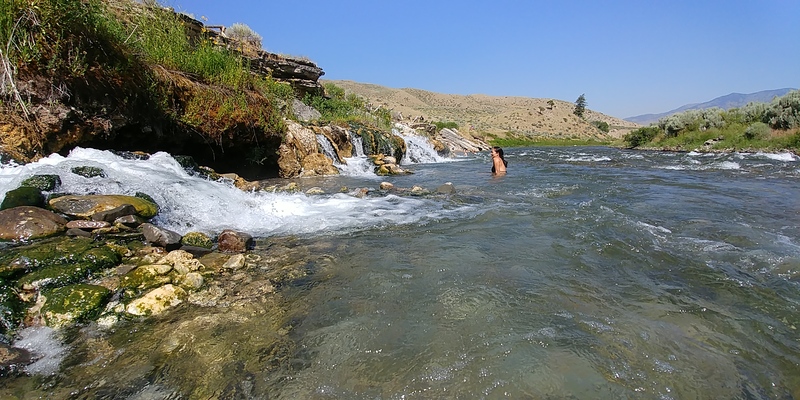 The boiling river – where hot springs and the Gardiner River mix for a fun bathing experience. 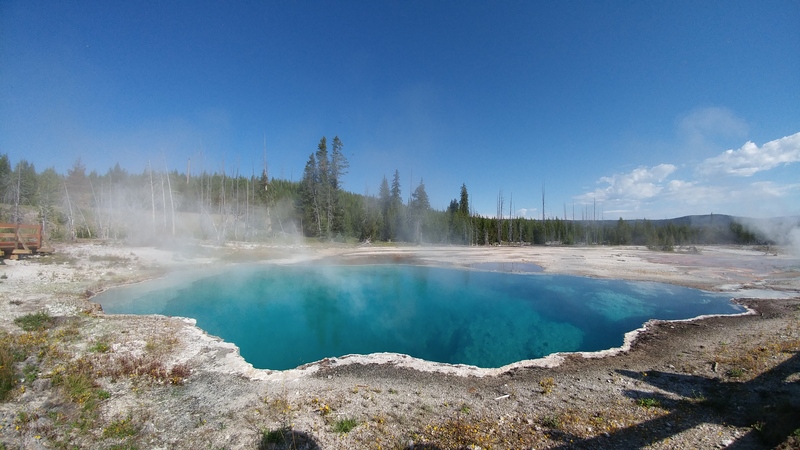 Just don’t get too close to the springs or you’ll get burned! 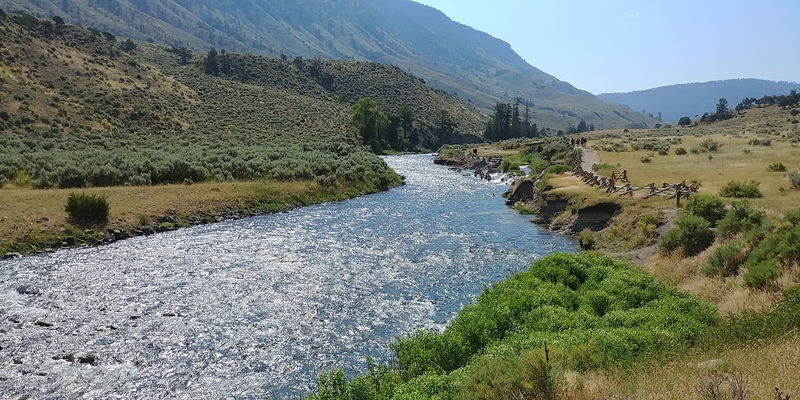 RV/Oversized vehicle parking: All the campgrounds mentioned above, except for Norris campground, are run by Xanterra and are reservable online in advance. It’s highly recommended you make your reservations early if visiting in the busy summer months as “campground full” signs were prevalent everywhere we went. 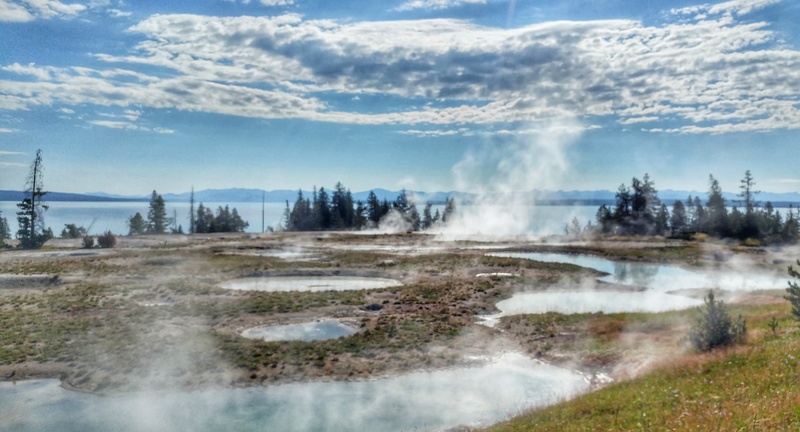 The NPS campgrounds are first-come, first-served. For most attractions, it helps to arrive early to secure RV parking if driving without a tow vehicle. After 10 am, getting spots can be tricky. Another benefit to arriving early is enjoying the views with fewer visitors around. You know I would’ve if I could! 😍 But the moms have horns too and seemed pretty protective. Lol. Fabulous. 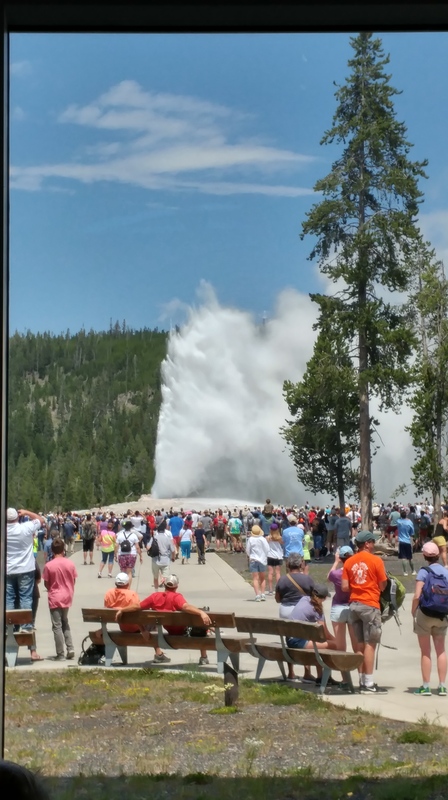 I’ve visited Yellowstone SEVERAL times and never seen anything as great as these pics. Thanks so much for such a nice comment! I’m glad you enjoyed our photos! 😃 Of course try as we might, photos still can’t compare to seeing these awesome featues in person.